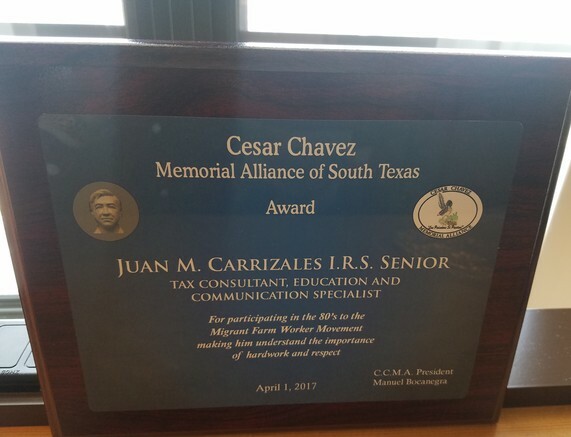 South Texas' Juan Carrizales recognized by the Cesar Chavez Alliance. Juan Carrizales of the South Texas Chapter was recognized for his contributions made to the City of Laredo and the high schools through his work in the IRS VITA program. 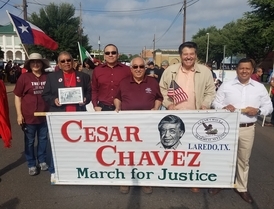 Along with other city leaders like the mayor, Juan and Judge Danny Dominguez led the march alongside one of the individuals that originally marched with Cesar Chavez who come from California for the occasion. In the picture to the left, from left to right: Dr. Alicia Carrillo, Robert Bustos (marched with Cesar Chavez), IRS TC Juan Carrizales, Dr. Madrigal, Mayor Pete Saenz and Judge Danny Dominguez. 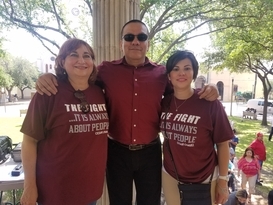 In the picture to the right, from left to right: Dr. Alicia Carrillo, IRS TC Juan Carrizales, and UISD Migrant Program Coodinator Nancy Newsome. Ogden H.I.R.E. chapter awards three $500 scholarships. 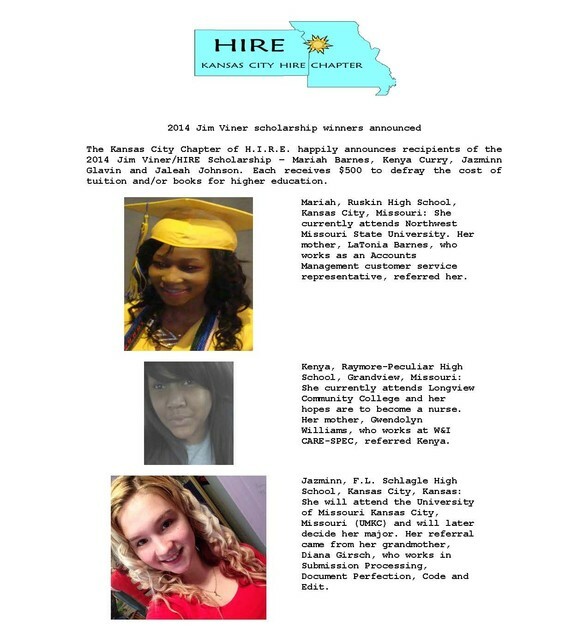 The Ogden Chapter of Hispanic Internal Revenue Employees (HIRE) recently awarded three $500 scholarships. Ogden HIRE Chapter President Evelyn Christensen led the ceremony. Longtime HIRE member and former scholarship committee chairperson Pat DeHerrera spoke to the attendees while the current chairperson Robert Felty assisted. She reminded this year’s recipients that HIRE members doing community service earned each scholarship dollar. “Remember to pay it forward when you have the opportunity,” Pat said. Nathan Jacquez, son of Joe Jacquez. Nathan is attending a master’s program in Oregon. Tamerra Sedacy, daughter of Tena Beal and niece of Tracy Beal. Tamerra studies at the University of Utah. Camille Owen, daughter of Darrell Owen and Angela Owen. Camille is pursuing her cosmetology license at Ogden Weber Applied Technology Center, OWATC. New Mexico H.I.R.E. 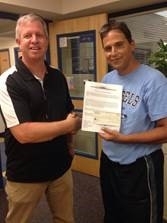 Chapter makes a donation to Governor Bent Elementary School. On August 8, 2016, David Duck (Chapter President) presented Ron Torrez (Counselor) and Jonhnathan Saiz (Principal) with six new backpacks, school and first aid supplies, and a check for $265.00. They were very thankful that HIRE, the IRS (their neighbor) reached out to help the kids that attend Governor Bent Elementary School. Pictured are David Duck and Ron Torrez. 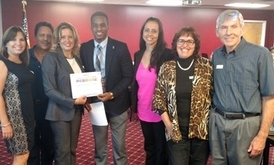 Volunteers honored with Impact Award – Stakeholder liaison Maritza Rabinowitz attended the Volunteer Income Tax Assistance Appreciation Day sponsored by United Way Heart of Florida. Maritza received the Impact Award, presented to the VITA site with the most filed and accepted returns. Maritza also received a tenure award for the most years of VITA service and an achievement award awarded to the volunteer with the highest level of VITA/IRS certification. Rio Grande Valley (RGV) HIRE Chapter members contribute to win worldwide recognition! "During the 2015 tax season, the United Way VITA volunteers completed 3,810 electronically filed returns and $3.6 million was refunded to the local communities. “If you ever wonder how to make a difference and help people in your community, then becoming a tax volunteer may be just right for you” said Irma Trevino, IRS Spokeswoman." "During the 2014 tax season, VITA volunteers completed 3,259 electronically filed returns and brought $3,095,654 in EITC refunds to Cameron County." HIRE members assisting with the VITA program include Irma Trevino, Socorro Mata, Dionnie Smith and Aleida Agado. We are extremely proud to partner every year with United Way Southern Cameron County. 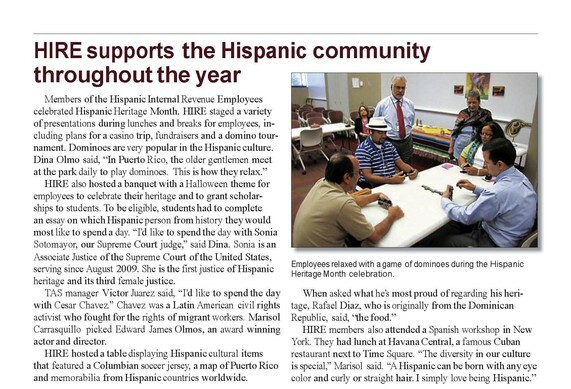 Paying tribute to our strong roots as we celebrate our bright future through H.I.R.E.! Hosted by the H.I.R.E. Los Angeles and Southern California chapters. The Easter Bunny gets help from Austin H.I.R.E. members! Children staying at the Austin Eastside and downtown Salvation Army shelters and at SafePlace, an organization that provides safety for families affected by sexual and domestic violence, were the happy recipients of more than 200 Easter Baskets. Austin HIRE members helped to solicit the donations, collected, assembled and delivered the baskets just in time for Easter. 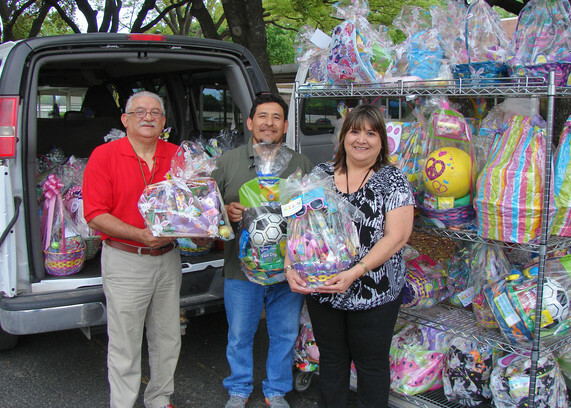 Austin HIRE members (l-r), Bobby Velasquez, Benny Briceño and HIRE president Graciela Duran-Briceño, load over 200 Easter baskets for delivery to children staying at local family shelters. We want to welcome Lydia Garcia and Audrey Etzenberger as the two new Vice-Presidents of the South Texas H.I.R.E. chapter. Audrey will be replacing Raquel Benavides and Lydia Madrigal will be replacing Marion on the board. A big Thank you to Raquel and Marion for all their contributions. We hope you both continue to be active in our chapter. Our very own Utah Chapter is featured in the January issue of W&I Offline. 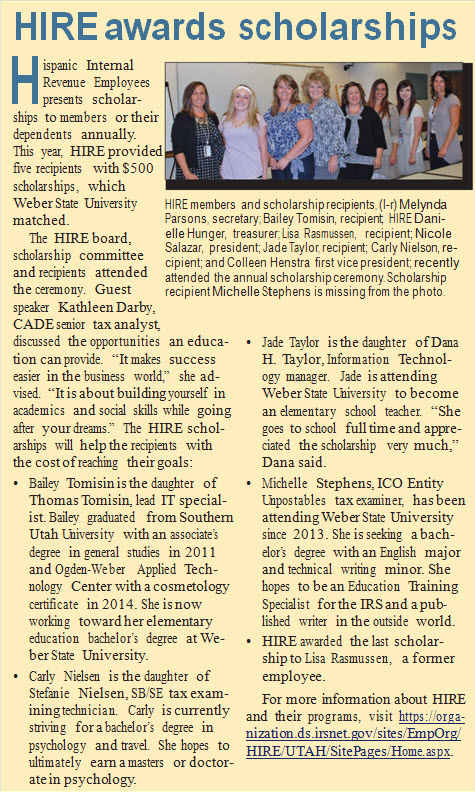 Please join us in congratulating Utah and their scholarship recipients! Congratulations to Maritza Ozepy!! 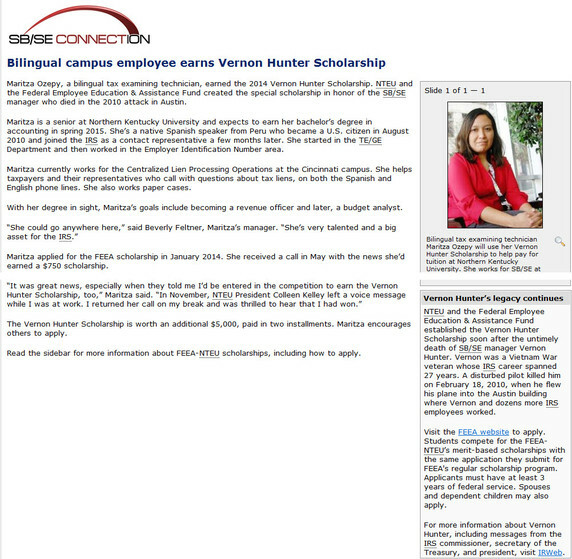 Maritza was featured in the SB/SE Connection as the recepient of the Vernon Hunter Scholarship and FEEA scholarship! Maritza is a a bilingual tax examining technician from the Cincinnati campus. Marita is working towards her accounting degree at Northern Kentucky University. Being the Cincinnati campus does not have a H.I.R.E. chapter at this time, the Illinois Chapter is eager to adopt Maritza as a member. 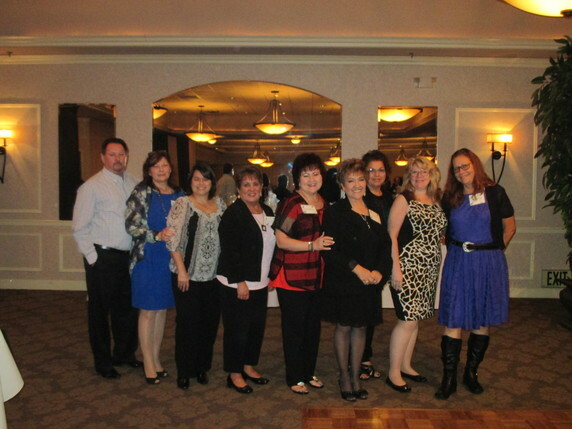 Fresno Chapter HIRE Board members on the picture from left to right: Gary Isaac, Denise Muselman, Lisa Spatalo-Knobluach, Shelleyann Romero, Janice Palacios, Alba DeLeon, Patricia Martinez, Debra Peroutka, Cynthia Laughridge, not in the picture Federico Garcia. the past, and hello to the future!" H.I.R.E. Board members and Alba L. DeLeon, Chapter President, would like to extend their gratitude to this year’s guest speakers: Compliance Director Mr. Chuck Buckla, Relationship Experts Walter H Jackson and Janet Alston Jackson, Department Manager Jessie Evans, and News Anchor Vanessa Ramirez. Our gratitude also to the Southern California Chapters, Patricia DiDonato, LB&I Team Manager, Financial Services/Financial Products Glendale, CA; HIRE West Coast Area Representative, Mayra Dimas, SB/SE Revenue Agent, Santa Ana, CA; Southern California Chapter President, and Shadow West Coast Area Representative, Maria Marin, SB/SE Revenue Agent, El Monte, CA; Los Angeles HIRE Chapter Treasurer, and Herlinda Leon, SB/SE Revenue Agent, El Monte, CA ; Los Angeles HIRE Chapter Vice President for attending the event. Additionally, Fresno HIRE would like to give a huge thank you to all employees who attended and their sponsors for helping make this Conference a success. Special Thanks to Grace Santa Cruz for sponsoring all the Management Assistants who were willing to attend; you made this event a success. The event was enjoyed by all; we look forward to next year’s event! If you find public speaking daunting, whether you’re presenting at an event or having a simple discussion, members of Toastmasters International say the nonprofit organization can help you speak with self-confidence in front of any audience. “The Toastmasters methodology helps me organize my thoughts. I’m more conscientious of the words I choose during normal conversation and during public speaking engagements,” said Exam manager Gabriel Pardo. The organization says it aims at providing confidence and strong communication skills. Their method is to learn-by-doing in a friendly environment for people who want to hone their public speaking and interpersonal communication skills. Toastmasters participants begin with a series of basic speeches and evaluate one another’s presentations, progressing to a more advanced set of presentations. Members choose the topics for their speeches. Toastmasters also develop their listening skills, improve their grammar, and learn how to conduct meetings using parliamentary procedure. Manager Gabriel Pardo advises others to use Toastmasters International to enhance whatever motivates them or whatever they’re passionate about in life. The California HIRE Chapter sponsors Toastmasters meetings twice a month on Thursdays. Participating employees must attend on their own time.